Maintaining his place on the international contemporary dance scene Opiyo Okach divides his time & develops work between France and Kenya. Through a long term choreographic development initiative Okach has acted as a catalyst for a new depth of intellectual reflection and encouraged the development of new perspectives and vocabularies in dance from east africa. Having received the ‘prix du Nouveau Talent Chorégraphiques SACD 2003’ Okach was recently awarded a ‘Prince Claus Award for Culture and Development 2005’. Artistic director of the first contemporary dance company in Kenya Opiyo Okach remains the principle figure of the choreographic landscape of the country. 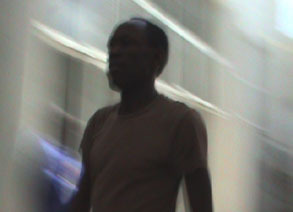 The prize at the second Rencontres Chorégraphiques Africaines 1998, for the company's first work - Cleansing, places him amongst the pioneers of a new generation of choreographers from Africa. Trained at the Desmond Jones School of Mime and Physical Theatre in London Opiyo Okach integrates dance in his work on his return to Kenya in 1995 and following research on traditional ritual and performance. During the same period he encounters the choreographers Alphonse Tiérou, Irène Tassembedo and Germaine Acogny. In I996 Opiyo joins Faustin Linyekula and Afrah Tenambergen to form the first contemporary dance company in Kenya, La Compagnie Gàara. With its creation, Cleansing, in which the mundane gesture of everyday cleaning gravitates towards violent purification, the company wins a prize at the Rencontres Chorégraphiques Africaines 1998. For the company Cleansing opens the door to the international scene (Montpellier Danse - France, MASA - Cote d’Ivoire, St Leu Danse - Reunion...). It also marks the beginning of support by principle figures of French dance such as Régine Chopinot or Mathilde Monnier. From 1998 the Ballet Atlantique Régine Chopinot actively supports and partners the group through a series of residencies and choreographic exchange. Having encountered them during an African tour she invites the company for a first residency at Ballet Atlantique.In 1999, she supports, in collaboration with the Centre Chorégraphique de Montpellier, the company’s new creation, Rituals of the Rock - inspired by the mythology of nomadic ethnic groups in east africa, composed of the trio Kit Mikaye and, notably, the solo Dilo - for which Opiyo Okach would become known in Europe. Between 2000 & 2002 Opiyo Okach lays the bases for a long time choreographic development project in Nairobi - Générations 2001, with the support of Ballet Atlantique Régine Chopinot, Association Française d’Action Artistique, Maison Française de Nairobi, Ford Foundation and the program Unesco-Aschberg Bursary for Culture. The project combines dancer training, residency programs, research and choreographic creation. 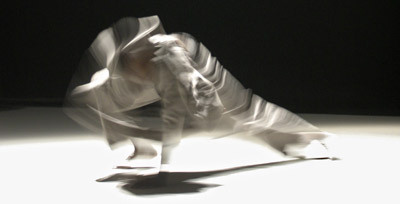 It is also within this context of exchange that they experiment the duo Borderlines with Régine Chopinot in December 2000.
presented in 11 countries in Eastern, Southern Africa and the Indian Ocean region ( French Cultural Centres, MASA), Iles de Danse in France and several European countries (Germany, Belgium and Italy). Following its discovery at Plateaux de Biennale du Val-de-Marne 2001 and its subsequent evolution at alternative Parisian scenes, the solo Dilo is noticed at Festival Avignon 2002 at the Hivernales. Dilo is based on improvisation and instant composition work, inspired by the mythology of nomadic ethnic groups in eastern Africa. Since its creation the solo has toured internationally to over 17 countries (France, Egypt, Italy, Slovenia, Germany, Netherlands, Belgium, Switzerland, Guyana, Russia, USA, Nigeria, Togo, Kenya, Burkina Faso, Senegal, Guinea...). In 2003 the society of authors and dramatic composers (SACD) awards Opiyo Okach the prix du Nouveau Talent Chorégraphique 2003. In the framework of Vif du Sujet the SACD commissions him to create a new solo for Festival d’Avignon 2003. His collaboration with Julyen Hamilton, the renown improviser, gives birth to No Man’s Gone Now an instant composition work. Inspite of the cancellation of Festival Avignon 2003 and Festival Paris Quartier d’Ete where the piece was to premier, No Man... premieres at Centre National de la Danse in January 2004 and has since known international success (Soirées Nomades of Fondation Quartier pour l’Art Contemporain, Plateaux de la Biennale du Val-de-Marne, Aix en Provence, Nouvelles Strasbourg Danse in France, Drei Wochen mit Pina Bausch in Düsseldorf Germany, Fabbrica Europa in Italy, Fitheb in Benin, Festival of Dhow Countries in Zanzibar, Godown Arts Centre Nairobi...). Today Opiyo Okach is artistic director of Gaara Dance Foundation - created in 2002 with the support of Ford Foundation to consolidate the choreographic activity initiated in Kenya. Its activities include choreographic research, artist residency, choreographic exchange, support for creation and diffusion of work. Regional and pan African exchange such as the Dance Encounters (East African Dance Encounters 2003, Retracing Connections 2004, Encoding Identities 2005) initiated in 2003 are part of its mission. The next international edition of the encounters are in 2007. From Cleansing to Dilo Opiyo affirms a unique style distinct from other work emanating from the continent at the time. Extremely bare, pure and minimal, simplicity, sobriety and elegance of lines, language of the body combining gravity and humour are the recurring key-phrases employed by the press to evoke this dance which escapes all etiquette. Improvisation and instant composition work has increasingly become the privileged choreographic tool; each performance a new version, in symbiosis with the moment and place. Cleansing s’inspire d’un rituel funéraire kenyan non pour en prendre la gestuelle ou la structure, mais pour en garder l’esprit: celui du contrôle (…) La danse est extrêmement délicate (…), respire ample, calme. Ni abstraite, ni expressionniste, elle est très intime, circulant d’une manière douce entre les trois danseurs aux crânes rases. Pas d’effet superflu, pas d’excès dans le spectaculaire (…) On pourrait penser parfois au butoh dans l’étirement du temps, mais le spectacle, très zen, échappe à toutes les étiquettes. Inspired in its structure, rather than steps, by ritual, this bare choreography, not afraid of slowness, evokes as much buto as minimal dance. As if it had suddenly accumulated enough light and heat to transform, the sculpture becomes human, unfolding (…) Opiyo Okach takes the space in his arms and cradles it. His elbows and shoulders under shadows in the invention of a world without apparent violence.